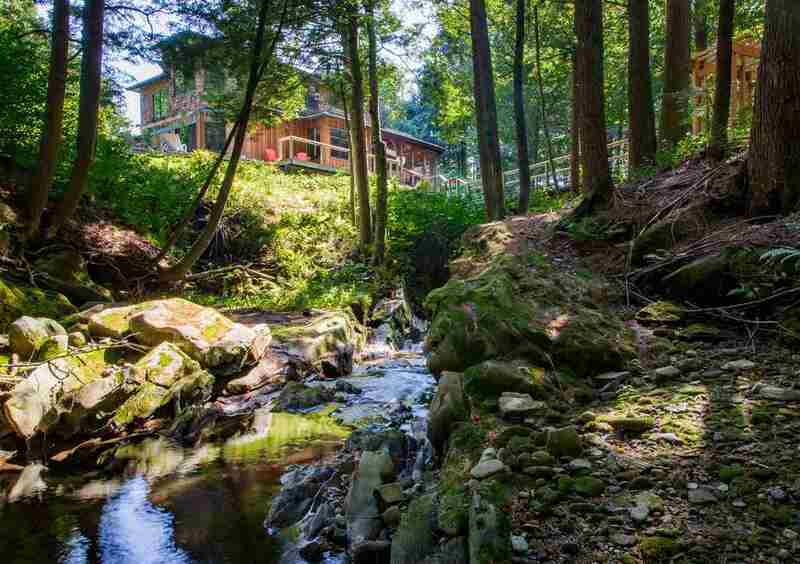 Above the banks of a rushing Vermont trout stream, this custom-designed modern craftsman home has a deep connection to the dramatic site and a spa-like ambiance. Wrap around decks and a screened porch radiate outward from the home, blending with nature to create indoor/outdoor living in the summer, while the fireplace and radiant floors make for a cozy winter refuge. The open floor plan features an airy eat-in kitchen with vaulted ceiling and skylights, custom cherry cabinetry, walk-in pantry, and Italian volcanic limestone countertops. A flexible floor plan with two bonus rooms allows for guests as well as a home office or studio. The second floor master suite includes a gas fireplace, walk-in shower, spa tub, and two walk-in closets. The third floor room is a lookout over the lush landscape having windows on all sides and can be used as an office, art, meditation or yoga space. The design and eco-friendly materials were carefully chosen, and the reclaimed wide-plank pine flooring forms a warm atmosphere. The grounds include mature fruit trees - apple, cherry, peach - and berries, along with a vegetable garden space. The pristine Snipe Ireland Brook flows through a rock-lined gorge and footbridge adding to the mystique of the location. Secondary access from O&apos;Neil Dr includes a driveway and one-car garage. Enjoy nature and privacy in every season. 3 minute drive to Richmond center, 5 minutes to I89 Exit 11, 20 minutes to Burlington, and close to skiing.